This is a similar idea to the Exploded Macaroni Omelet dish that I made several months ago. 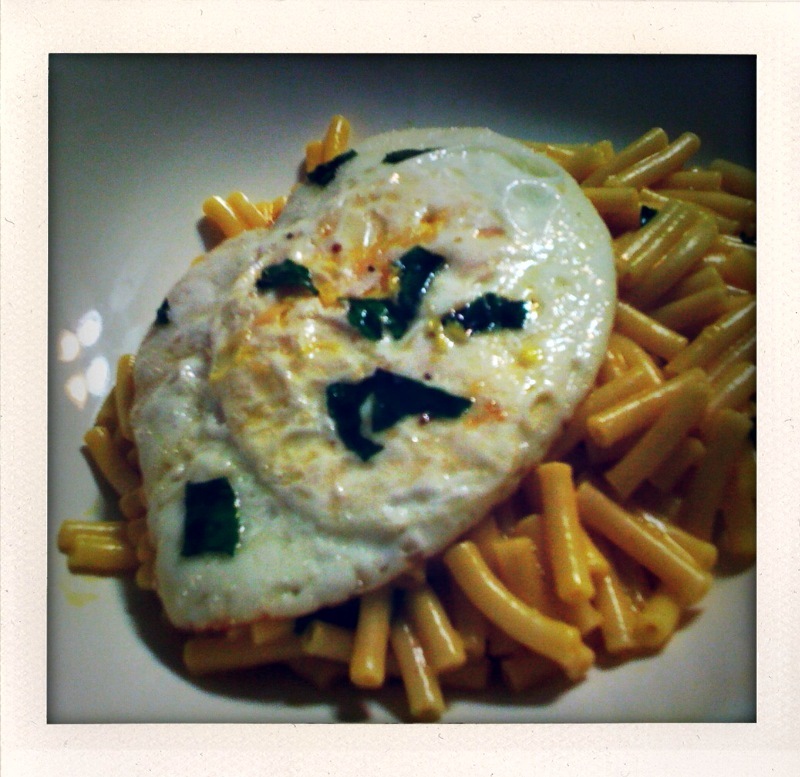 It is a simple, straight forward cheese, egg and pasta seasoned with some fresh torn basil, garlic, salt and cracked pepper. It made for a tasty wake and bake munchie-hangover cure. Place 1/2 tbsp of butter in a small skillet or frying pan set to Medium-High heat. Crack an egg in the frying pan when the butter melts. I like to bust open the yolk with a spatula. Tear or cut up the basil leaves and sprinkle on top of the eggs. Add pasta back in and mix well. Salt eggs in the frying pan. Flip eggs for 30 seconds and then remove and place yolk side up on top of the Mac n' Cheese. Crack some Garlic-Pepper to taste. If you don't have garlic pepper, you can add ~ 1 tbsp minced garlic to the butter to fry the eggs. You can also garnish with a little shredded cheese if you have some on hand. EAT WITH A KNIFE AND SPOON! Tried this yesterday morning and it was hell'a good. You've got a great blog here, maybe post something a bit more challenging I enjoyed making the somasa pie, was something new for me. This is the BEST hangover cure! 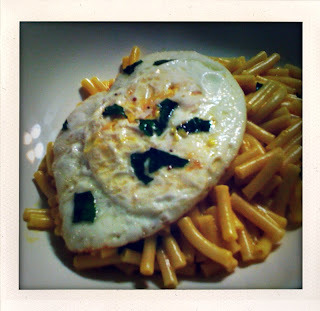 Got to love boxed mac and cheese...and doesn't everything taste better with an egg on top? This is a healthy meal to try. You can mix various herbs as well.